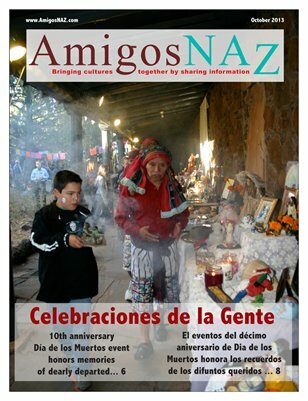 The October 2013 bilingual edition of AmigosNAZ opens with a cover story on the 10th anniversary of Celebraciones de la Gente, to be presented Oct. 26-27 at the Museum of Northern Arizona in Flagstaff. The edition also includes a profile on the new Coconino County manager; details on a new quit smoking program offered through Coconino County, a community commentary supporting a property-tax override vote on Nov. 7 to benefit Coconino Community College; a community commentary on neighborhood associations; a story on the proposed property-tax vote; a question-and-answer article on the Health Insurance Marketplace; tips on protecting your identity; and cooking ideas for Hispanic Heritage Month and a calendar listing of upcoming Hispanic Heritage Month events. All this and more brought to you by AmigosNAZ — Providing information for and about the vibrant Latino community in Northern Arizona.